So, in my inbox today was this awesome tidbit! Jeff Mauro, who has hosted several shows on the Food Network is launching his first restaurant, Pork & Mindy's and the official opening is this Friday. I had the opportunity to interview Mauro a while back for a foods article I wrote for the NWI Times and he was such a friendly and genuine guy - the kind that you really want to see succeed. The fact that he's a Chicago guy makes him just that much more likeable. I'm so excited about his new venture, which sounds pretty amazing. Read on for all the details. There are some fun opening weekend events. 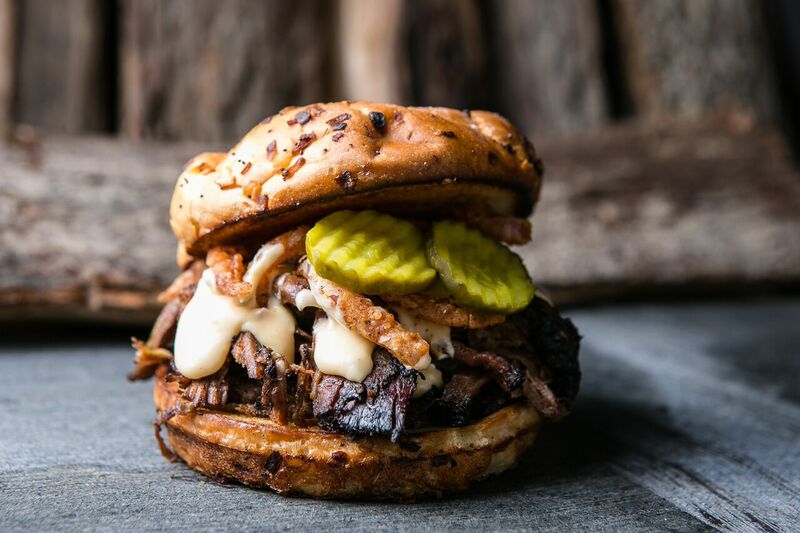 CHICAGO – January 6, 2016 – Pork & Mindy’s, the first restaurant from Food Network star and lifelong Chicagoan, Jeff Mauro, will officially open on Friday, January 8, 2016, in Chicago’s thriving Bucktown-Wicker Park neighborhood at 1623 N. Milwaukee Ave. Offering inventive, chef-driven sandwiches and salads in a vibrant, energetic setting, the fast-casual concept – a slowed-smoked sandwich shop – is unlike any restaurant currently on the market. With a strong emphasis on slow-smoked, hand-pulled meats, Pork & Mindy’s menu is shaped by combining simple ingredients to make a bold, complex statement and prominently features the brand’s line of flavorful, all-natural dipping, marinating and grilling sauces currently sold online and at leading retailers, including Mariano’s. Featuring a diverse and approachable menu created by Mauro and founder and company CEO, Kevin Corsello, Pork & Mindy’s Bucktown-Wicker Park location will highlight the brand’s signature slow-smoked sandwiches, including unique options like their already award-winning Bao to the Pork, featuring hickory-smoked, hand-pulled pork shoulder, pickled daikon and carrot, fresh cucumber and jalapeño relish, topped with Pork & Mindy’s Asian Plum sauce; as well as the Chicken and Waffle, made with brined, mulberry-smoked, hand-pulled chicken and topped with green apple slaw, pickled red onions, served on a custom maple bourbon “waffle” bun. 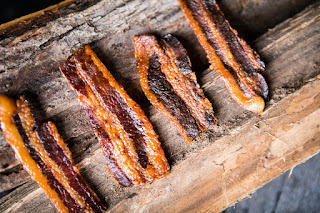 The menu will also include the Pig Candy B.L.T., featuring the brand’s famous Pig Candy bacon (dusted with brown sugar and slow-smoked until brittle), lettuce, Roma tomato, dry rub mayo and balsamic caramelized onions on a buttered and griddled brioche bun. Guests can also expect to find a variety of fresh salads, such as the Chopped Candy Cobb, as well as a host of tasty, unexpected sides, including Tot’tine – a one-of-a-kind spin on poutine that includes crispy tater tots and Wisconsin cheddar cheese curds, smothered in a house-made smoked gravy and topped with picked red onions – as well as a Sweet Potato Salad and PNM Baked Beans, made with fresh mixed vegetables and slow-smoked to perfection in the brand’s Chicago Smokehouse sauce. Dessert-lovers can indulge in Pork & Mindy’s signature ‘Nado’s, including the Memphis ‘Nado (premium vanilla ice cream, peanut butter, banana and Pig Candy) or the Cannoli ‘Nado (premium vanilla ice cream, whipped ricotta, chocolate chips, pistachios and broken cannoli shells). Corsello and Mauro have purposely sought to create a concept that appeals to the masses, while also empowering and supporting the hyperlocal neighborhoods in which they reside. From utilizing locally-sourced, sustainably-produced ingredients to featuring home-grown artistic talent, Pork & Mindy’s is committed to building and strengthening communities by connecting people’s passions for food, music and art. The warm and vibrant space, designed by OHR Consulting, will feature design elements of charred wood throughout as a nod to the restaurant’s proprietary smoking process, accented with pops of Pork & Mindy’s signature hot pink hue. In creating ever-evolving exhibition opportunities for local emerging artists, Pork & Mindy’s 2,500 square-foot, 40-seat restaurant space will also prominently feature works curated by Art Director, Adam Kaplan. With exhibitions rotating on a bi-monthly basis, Pork & Mindy’s art program will serve as an avenue for local artists to gain exposure, while also sparking conversation among diners. Pieces from photographer, Frank Styburski, and encaustic painter, Kari Hall, will be featured as the restaurant launches and will be available to the public for purchase both in-store and online at www.porkandmindys.com/shop. Pork & Mindy’s will also spotlight emerging local and national musicians, bands and deejays as a core component of the brand’s vision. The curated, in-store sounds will set the mood for the brand the moment people walk in the door and, in addition to its “Back of the House Sessions” content series, will give customers insight into the soul of the brand through exclusive one-of-a-kind experiences. The brand’s first featured musicians in the “Back of the House Sessions” include multi-instrumentalist and psychedelic enthusiast, Jude Shuma, as well as the hyperreal aesthetic of Idyll. To introduce the concept to the Bucktown-Wicker Park neighborhood, Pork & Mindy’s will offer a number of exciting (and delicious) opening weekend promotions beginning Friday, January 8 and running through Sunday, January 10, including complimentary Pig Candy and limited-edition art and music giveaways from a variety of local artists. Headquartered in Chicago, Ill., Pork & Mindy’s is a new brand devoted to building and strengthening communities by connecting people’s passions for food, music and art. Founded in 2015 by Harvard Business School grad and barbeque aficionado, Kevin Corsello, and long-time friend and Food Network star of Sandwich King and The Kitchen, Jeff Mauro, Pork & Mindy’s is a modern, community-based company that is committed to delivering amazing culinary experiences. The company’s first fast casual restaurant concept opens on January 8, 2016, with plans to launch additional locations nationwide in 2016. Pork & Mindy’s currently offers three delicious sauces sold online, as well as at Mariano’s locations throughout Chicagoland and Pick ‘n Save, Metro Market and Copps stores in Wisconsin. The company plans to expand nationally in 2016 with additional sauces and a broader product line. For more information or to inquire about investment & franchise opportunities, visit www.porkandmindys.com. Follow the brand atwww.facebook.com/porkandmindys and at @PorkandMindys on Instagram and Twitter.